Rain Gardens are a type of bio-retention cell consisting of just the engineered soil layer with no gravel bed below it. Rain Gardens are a type of bio-retention cell consisting of just the engineered soil layer with no gravel bed below it.Rain Gardens are shallow depressions filled with an engineered soil mix that supports vegetative growth. They are usually used on individual home lots to capture roof runoff. Typical soil depths range from 6 to 18 inches. The capture ratio is the ratio of the rain garden’s area to the impervious area that drains onto it. 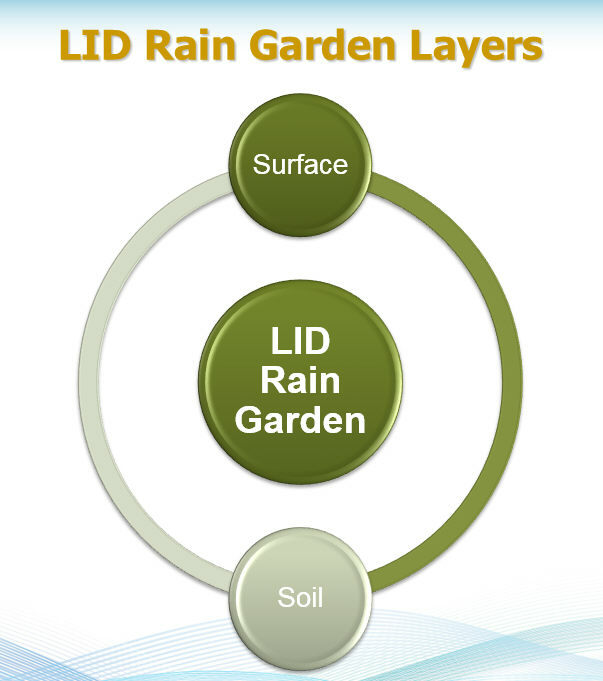 The two layers used in a simulation for a Rain Garden LID are shown in the following image. See the topic Bio-Retention_Cell_LID_Reference_Values.htm for a discussion of parameter values for Rain Gardens.